Amu Darya Sea to Source – Mission Completed! 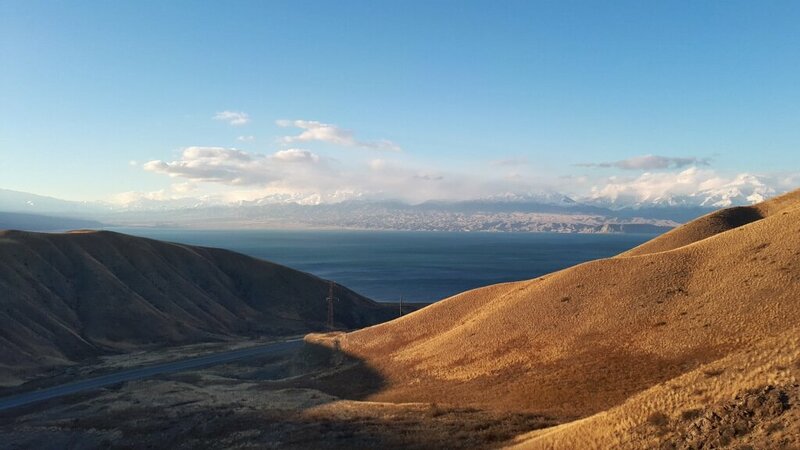 We recently finished the first ever sea to source trip along the Amu Darya River, in Central Asia. 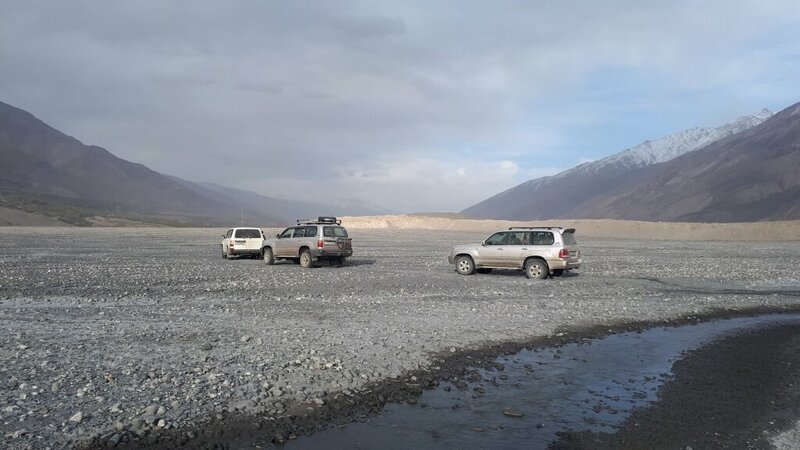 Starting at the outflow into the remnants of the Aral Sea, a small group of hardy travellers followed this epic river thorugh Uzbekistan, Turkmenistan, Tajikistan and Afghanistan. Our sea to source expedition along the Amu Darya river has begun. Today’s drive north to the town of Moynak began by crossing the Amu Darya itself near the city of Nukus. Here it is little more than a couple of streams in a wide sandy bed, covered in scrub bushes. 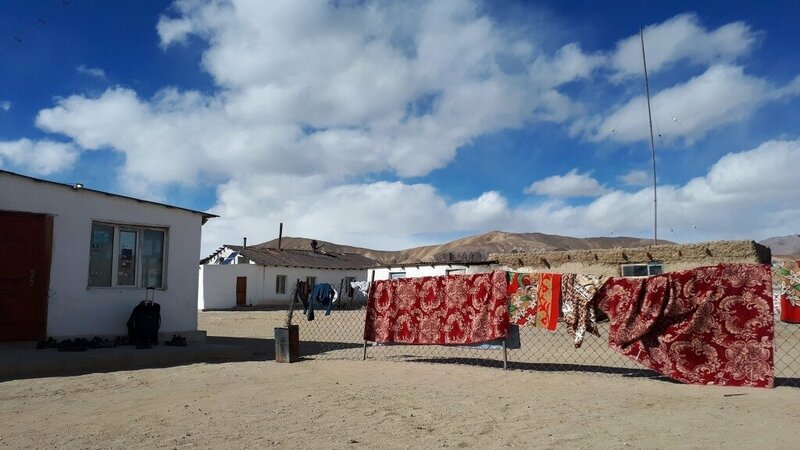 Passing hundreds of cotton fields we found our way to the former fishing port town of Moynak, famed now for its ghost ships beached far – 150km – from the Aral Sea shore that once gave it purpose and provided jobs in fishing crews and canneries for over a thousand residents. In 1960 this was the 4th largest inland body of water in the world. 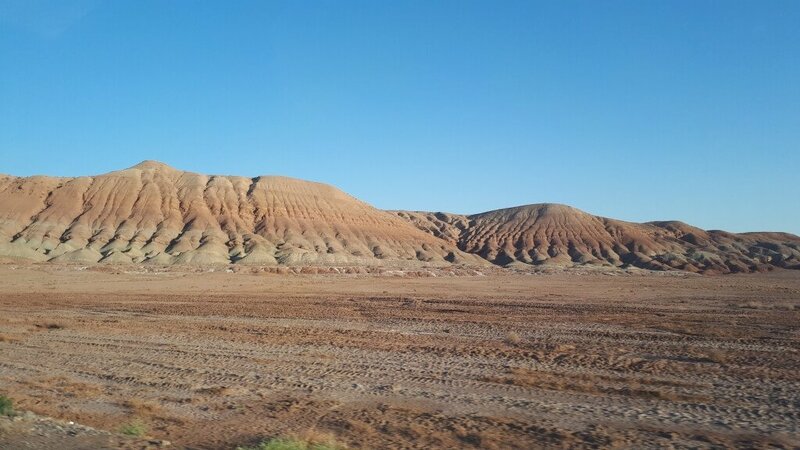 Now, after 5 decades of sustained water extraction to grow cotton, taken from the two rivers – Amu Darya and Syr Darya – that feed the Aral Sea, just two small remnants are left. It’s an environmental catastrophe and the town has a somewhat melancholy air. And yet the people here have been welcoming to us as we wander the defunct, dessicated former harbour. And many remain optimistic about their future. We have now left the dry shores of the Aral Sea and travelled south. Stopping to chat to cotton pickers on the way, we saw how labour-intensive this crop is. 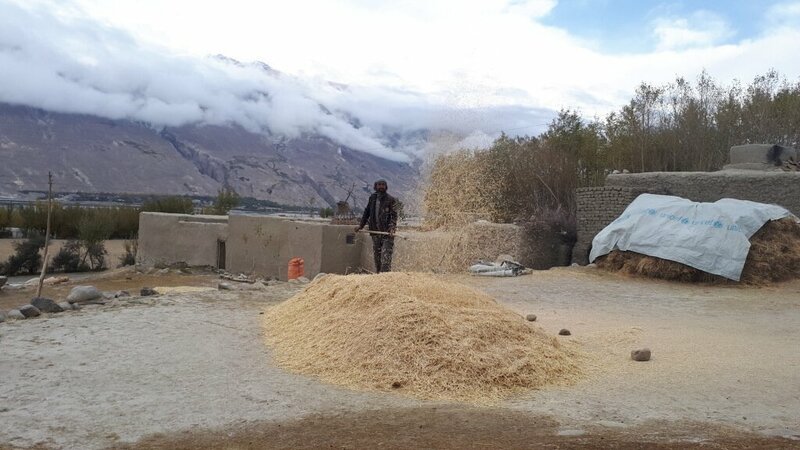 The fluffy seed heads are the bit spun into cotton, and it is piled into huge white mountains ready for initial processing. The Amu Darya at Nukus is a mere trickle in a wide sandy bed. 200km later in Urgench it is far wider and deeper. The reason is the numerous canals or ‘collectors’ that take its water off to irrigate the fields. After Urgench we have arrived at the superlative-bustingly-beautiful Silk Road city of Khiva. What a delightful city with its ramped defensive walls and unique architecture. The tiling in particular is magnificent. Tomorrow we head through the desert to Bukhara, one of the true jewels along the Silk Road. Our Amu Darya sea to source adventure continued yesterday from Khiva to Bukhara. 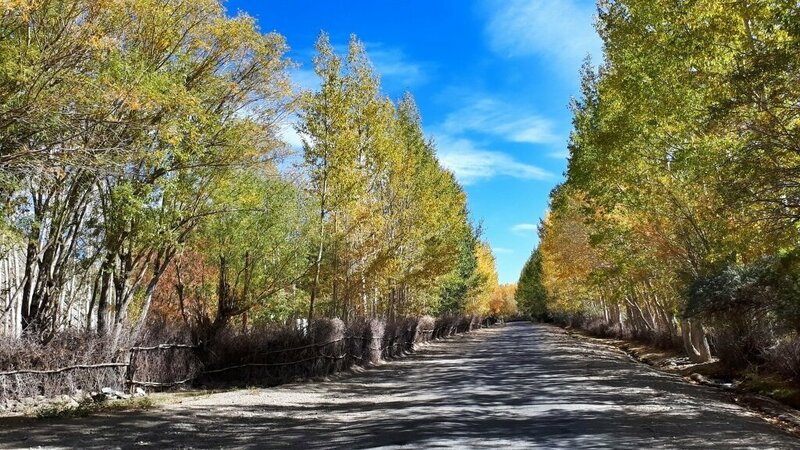 Two important Khanate cities along the ancient Silk Road, they are very different cities each with charms of their own. Separating them are nearly 500km of barren desert, interrupted every so often with glimpses of gas flares from petrochemical plants over the northern horizon and by occasional views to the south over the Amu Darya and into Turkmenistan. 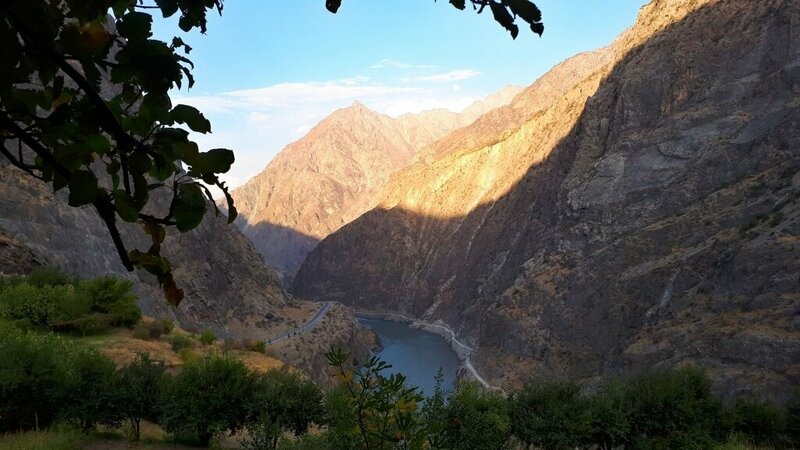 The river here is certainly the bringer of life, and without it one can imagine that the Silk Road would have needed to find another route to avoid the scorching desert. A pre-dawn visit to a mosque in Khiva by the east gate was rewarded with the mullah inviting us to climb the minaret. A dizzying and dusty 90 ancient steps later and the city was laid out before us. Delightful. Today we explore the superlative beauty of Bukhara. We waved goodbye to our river yesterday and today enjoyed the splendour of Bukhara. This former city-state has for many hundreds of years been a place of mystical repute, of fantastic arts, architecture, culture and a seat of learning for a millennium and beyond. There is so much to see here that a mere description on Instagram would seem churlish, but suffice to say that the superlatives used in relation to the city are not wasted…. Amongst the gems are artisan metal, ceramic and textile workshops producing fine examples of their arts, musicians still plying their trade and the most sumptuous carpets you can imagine. The city is filled with ancient parks, and there’s the ‘ark’ citadel palace, mosques and madrassahs and city walls 50 metres thick. The registan with its high Kalyan minaret does not disappoint, and at every bend in each twisting back street is another story writ large in ancient and grand architectural prowess. During the Great Game, British officers Stoddart and Connolly were executed here after spending time (a long time…,) in the infamous ‘bug pit’ of Bukhara. It’s all still here to be explored. We’ve had a great three days in Turkmenistan, following the Amu Darya river up to the Afghan and Uzbek borders in the far east of the Lebap region of this beautiful, wild country. Crossing the border at Farap, one is immediately confronted by sand, lots of sand. And yet as soon as the river appears, so does agriculture and increasing signs of prosperity. There is lots of cotton grown, plus rice, wheat and corn. The Amu Darya river here is now far more of a force to be reckoned with and significant bridges are needed to cross it. 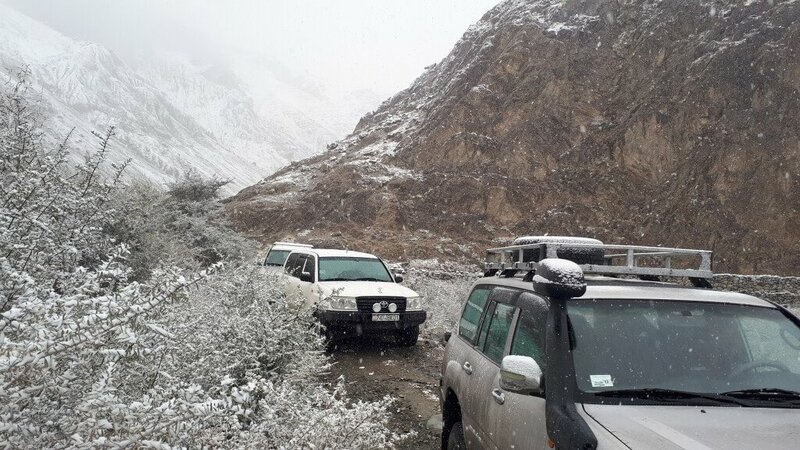 Roads are generally good and we are warmly welcomed by our super team of local drivers and guides. Stops are often made to sample the most delicious and sweetest melons we’ve ever tasted. Every Central Asian male is an expert in choosing the best melon, or so it would seem! It’s a long drive across often barren deserts to the Koyten Dag region where the flat lands rise towards Turkmenistan’s highest peak, the 3138m Ayrababa. 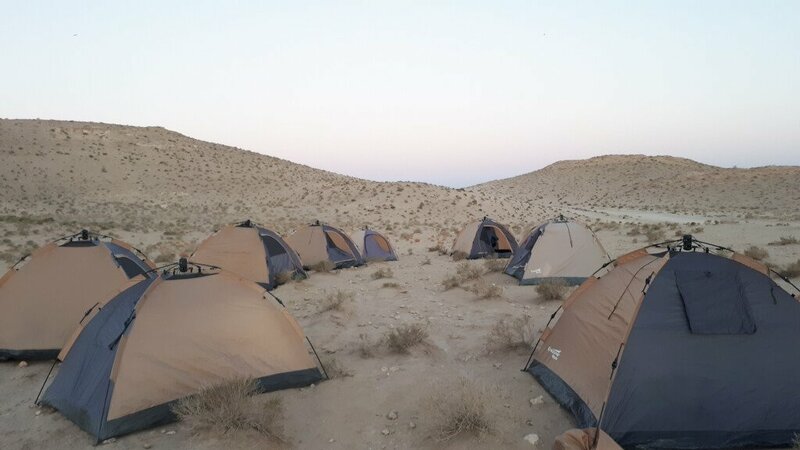 We’ve camped in open desert and drunk tea fresh from the fire, we’ve trekked through mountain gorges to sacred caves, seen Jurassic dinosaur footprints, explored 12th century shrines and Silk Road fortresses, been met with warmth and kindness and seen a different side to this little-visited country. It has been a delight, but our route now takes us via the Golden Road to Samarkand. 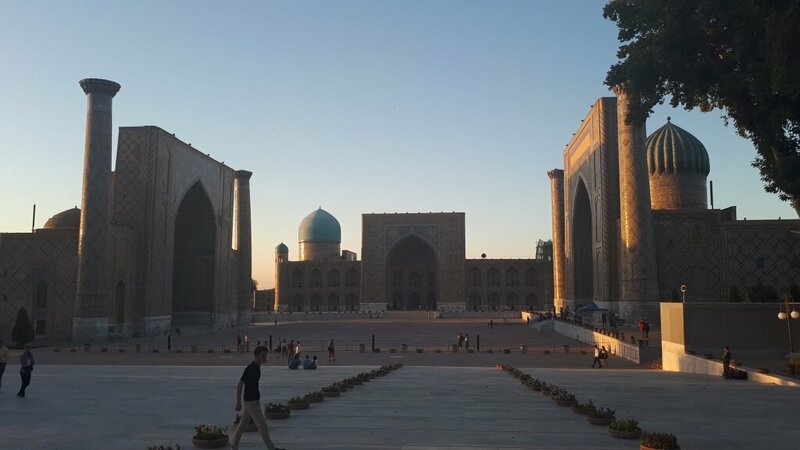 We could post another hundred pictures of Samarkand’s minarets and superlative Silk Road architecture, ceramics or textiles.and wow, what a city it is. But as with any trip, it’s usually the people who make a place what it is. In Samarkand we were lucky to stay with the ebullient, friendly and efficient Firdaus in his century-old Jewish merchant house to the south of the registan square. Not only did we receive the warmest of welcomes but we breakfasted like royalty in the opulent surroundings of the historic drawing room. With huge thanks to the team at the Rabat Boutique Hotel, we now move on to our third country – Tajikistan. After a brief spell away from the Amu Darya River as we crossed from Uzbekistan into Tajikistan at Penjikent and a couple of days exploring the capital, Dushanbe, we rejoined our riverine superhighway on the Afghanistan border at Zighar. 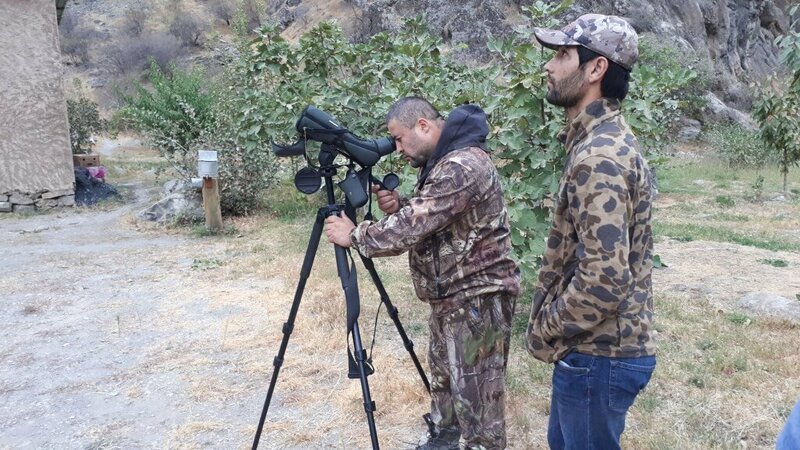 The camp at Zighar where we spent the night is used for both hunting and conservation, with controlled hunting helping to fund conservation of key species, including snow leopard. 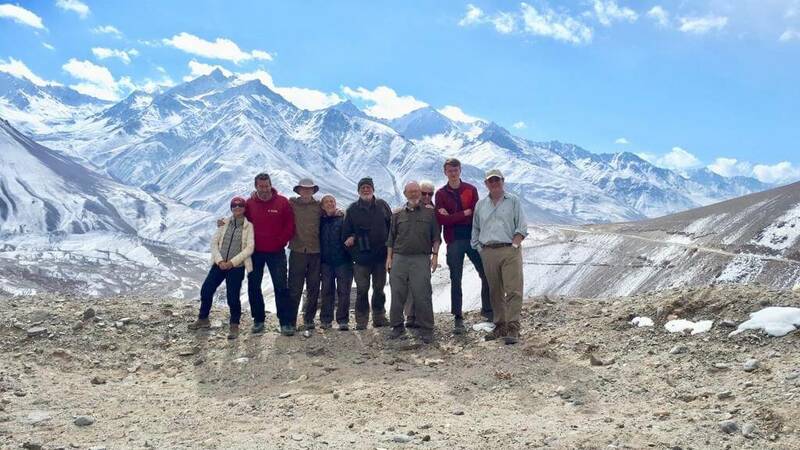 Our group rose early and headed out with our superb guides to try and spot Bukhara Markhor – a large species of mountain goat specific to this area of Tajikistan. .
We were lucky to have our early start rewarded with a sighting of around 20 females and juveniles high above us on precarious slopes. 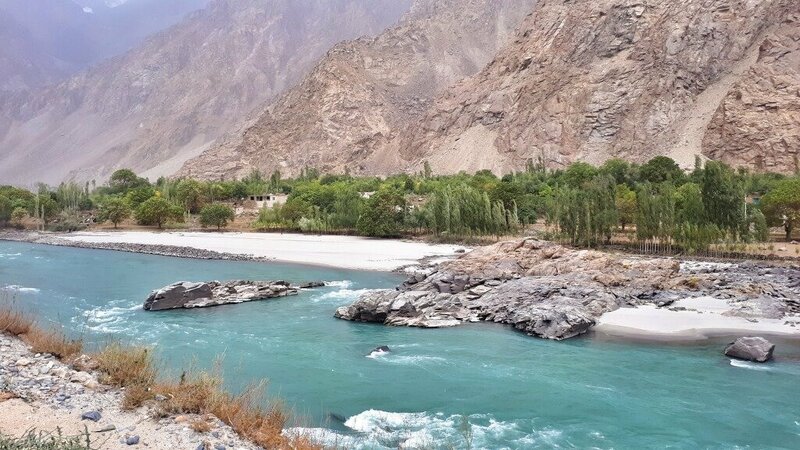 Following the river south – now called the Pyanj – we stayed in Khorog, the capital of the Gorno Badakshan region before taking a refreshing dip in some hot springs. 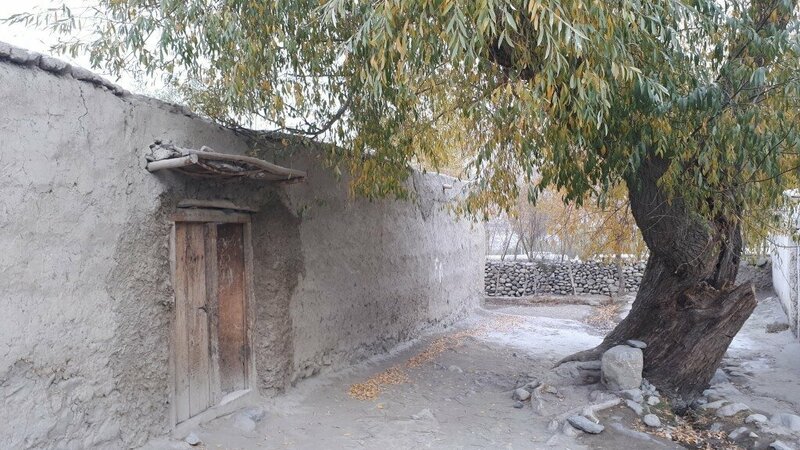 Next on our route is the district of Wakhan in Afghanistan, with less then 200 tourists visiting this year, it promises to be a superb experience as we trace the river towards its source. 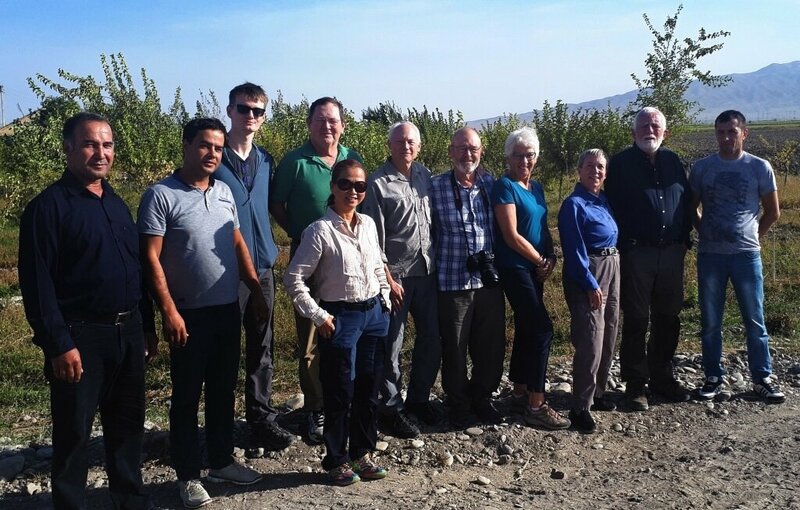 Our Amu Darya – Sea-to-Source – expedition has spent a delightful few days over in Afghanistan. 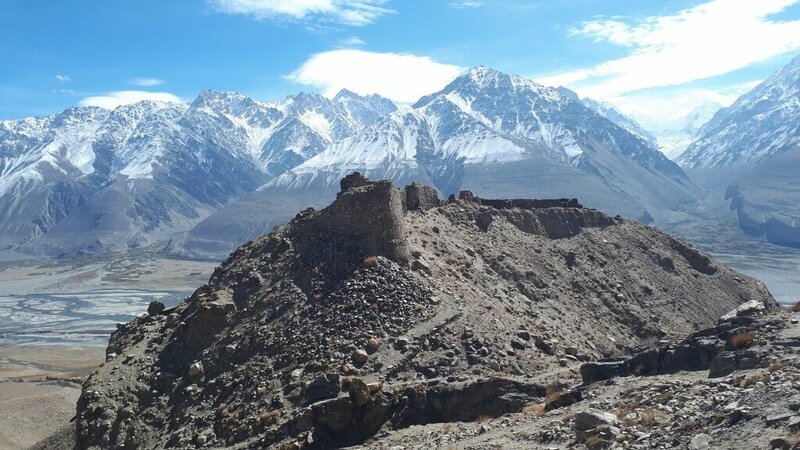 The Afghan Wakhan is arguably the only marginally ‘safe’ part of this incredibly beautiful and diverse country at the present time. It’s such a sadness that the country as a whole evokes such strong and yet strongly misunderstood emotions across most of the rest of the world. In our time in the country we have been met with nothing but smiles and curiosity. Sure, the change from the headscarves and jeans of Tajikistan to the burqa and perahaan/tunbaan and patkul hat is instant but the welcome is sincere and immediate. Tea is drunk and tales are told. We have felt no danger whatsoever, the food has been simple but tasty and given with pride. Hospitality has been from the heart. .
We have stayed in family homes and broken bread with ordinary people like ourselves. We’ve dipped in hot springs, been met by governors and seen huge snow peaks little-travelled by human feet. 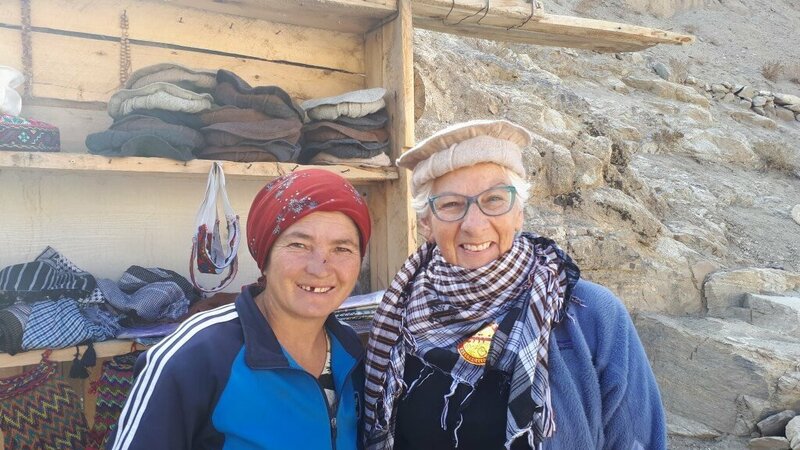 The higher parts of the Wakhan Valley are inhabited by Kyrgyz nomadic herders but sadly an early but very cold snap (minus 20 C at night and heavy snow) put a stop to our progress towards the source and the sensible option was to turn around and be safe. The source of the Amu Darya, now the Wakhan river, lay tantalizingly about 160km further up the valley and will await us another day. We wish all our Afghan friends a safe series of elections in the coming months and we hope to meet you again one day soon. 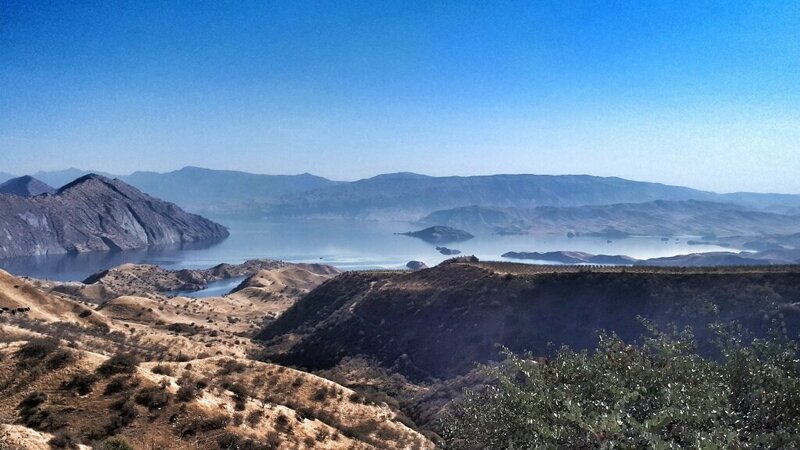 For now, onwards into Tajikistan to cross the Pamirs into our final country, Kyrgyzstan. After leaving Afghanistan, we have also now left the Amu Darya river behind. Having followed it from its outflow in the Aralkum desert of the Karakalpakstan region of Uzbekistan over 2200 km ago, we shall miss it being our constant companion! But here on the Murghab Plateau of Tajikistan at 3700 metres, the beauty of the landscapes never disappoint. This is such a visceral and otherworldly place and we always adore our visits here amongst some of the most welcoming people on earth. 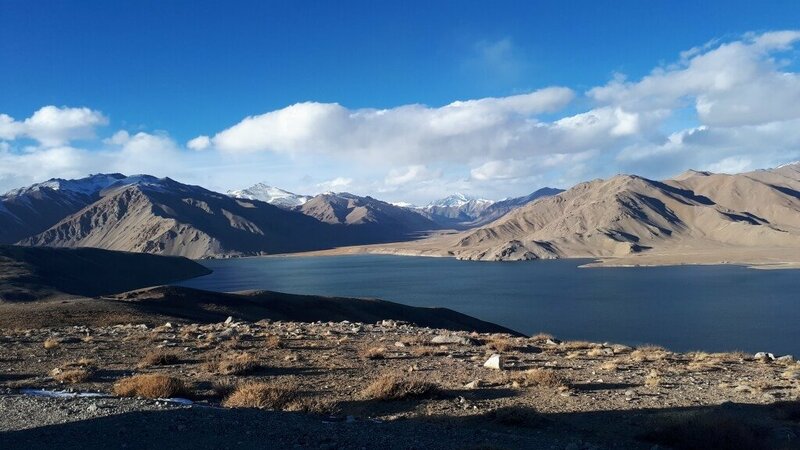 The gorgeous vista pictured is across Yashilkul Lake at around 3700 metres. It was formed in prehistoric times by glacial retreat and after a disastrous attempt to increase fish production in the Soviet era (five non-native species of fish were introduced) it now contains just one species of rather giant trout. 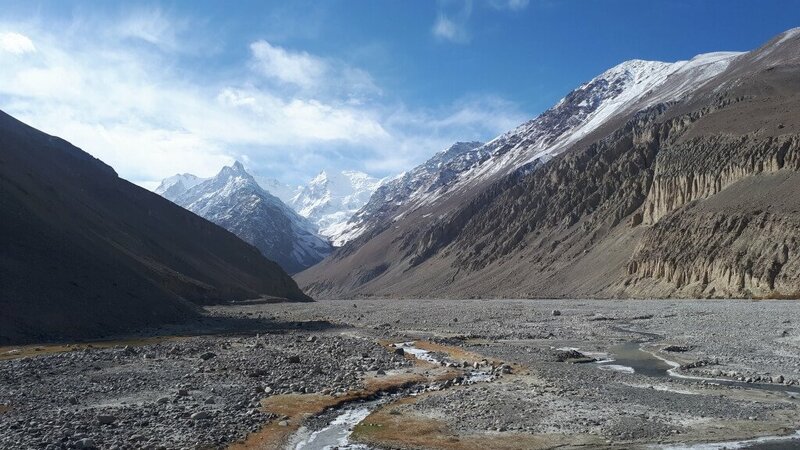 In the far distance you can see the Northern Alichur Range, behind which lies Lake Sarez and the Bartang Valley system. 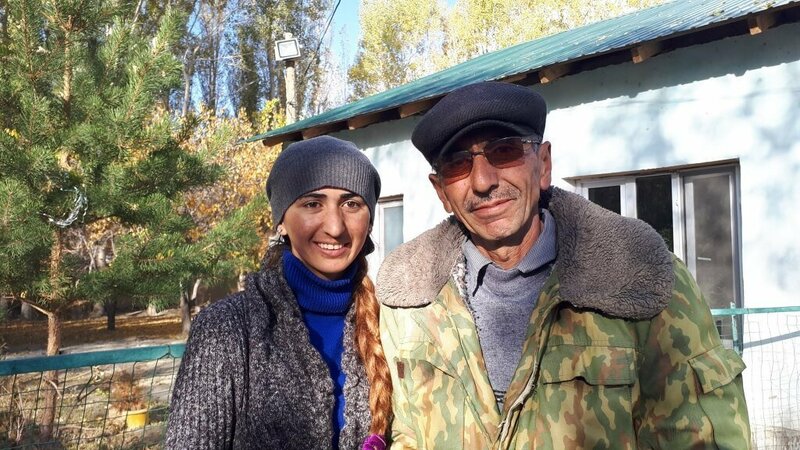 Our lovely guests have now departed from Bishkek, the end-point of our unique Amu Darya – Sea to Source- expedition. .
It’s been a blast and no doubt we’ve all taken away memories that will last a lifetime. Central Asia gives so much to those who explore here. .
We’ve seen ships in the sands, poked-about in 2000 year-old fortresses, bathed in hot springs as snow fell on our heads, seen dinosaur footprints, explored epic Silk Road architecture and citadels, shopped in bazaars and got to know ‘our’ river along almost all of its beautiful course. We even got in and swam in it where frost clung to the banks! But as with most journeys in populated places, it has been the people who’ve brought it to life. From the Karakalpak and Uzbek people who showed us their deserts and the great cities of Samarkand, Khiva and Bukhara to the Turkmen who guided us in the remote mountains of Koytendag. .
From the Tajiks and Pamiris (including the Bartangi, Shugnani and Wakhi people) whose mountainous homes and warm welcomes beguiled us, to the Afghans who could not have been more open or hospitable to us and finally to the Kyrgyz whose high altitude lifestyle and culture just impresses on so many levels. .
To all these wonderful people, a heartfelt note of thanks from us all for making our trip so very special and for helping bring the landscapes to life. We will run the trip again in 2019 for another lucky small group, so get in touch if you’d like to see all this yourself. For now, from the city delights of Bishkek, mission completed.